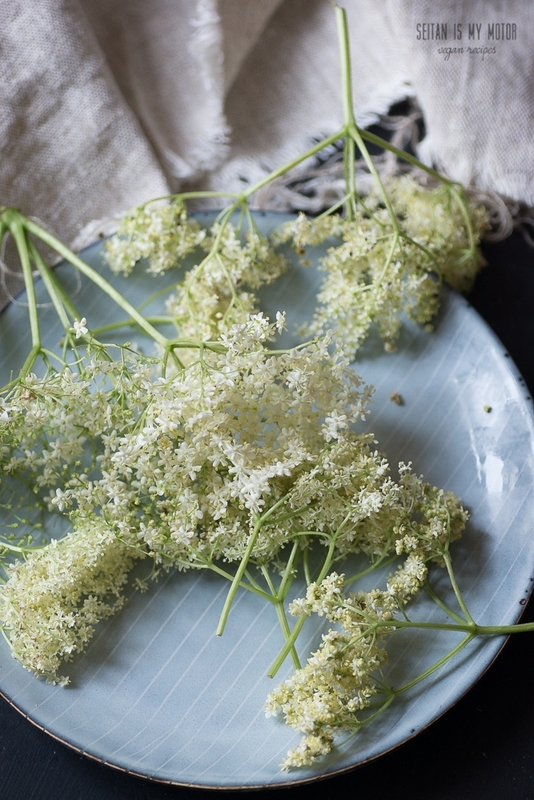 These tiny elderberry flowers are the most flavourful thing you can imagine. During the year there is only a short window where you can pick them. Here in Dresden, this window is almost over. And still F and I went out on a rainy Sunday to pick the last umbels in a park nearby. Those we could reach at least. Because most of the flowers which were growing at eye level had already been picked. And around us the people have probably stocked up on elderberry syrup that they made to preserve the exceptional taste these fragrant blossoms produce. Since we didn’t find many flowes left, syrup was out of the question. When I told F that we had wandered through the rain and still there would be no syrup, she was furious. It had taken me over 30 minutes to convince her to go out. I had promised her sweet syrup. And now I couldn’t deliver. To console her I told her about Hollerkuechle. These are battered deep fried elderberry flower umbels that can be eaten with sugar. F didn’t think that was a good idea. She was still mad. She wanted syrup. She sat down on the sofa and didn’t move for five minutes. Then suddenly she jumped up. “Okay, mum. Let’s make a compromise.” This child is very, very good with language already and a compromise usually means that she’ll turn into the most convincing four year old lawyer you can imagine. And that she’ll get her way. But this time she really meant compromise. And she had a very good idea. Since it was Sunday she suddenly wanted waffles. With elderberries. Sounded exactly like hollerkuechle to her. And I didn’t mind. In fact I thought that was a really wonderful idea. So off into the kitchen we went. In Germany we never eat waffles for breakfast. Because here they are a treat for Sunday afternoons where they sometimes replace the traditional cake. 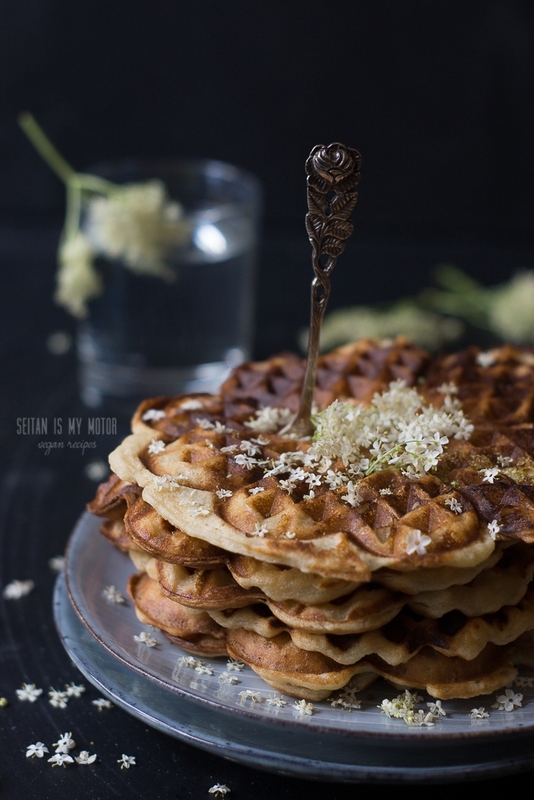 Baking waffles is a Sunday ritual in many families and it has to be celebrated properly. Someone makes the batter, someone else heats the cherries or the raspberries, and another person has to whip the cream. To be a proper cake substitute waffles need two things: fat and sugar. Both ingredients help them stay moist and crispy at the same time. Which comes in handy if you want to recreate something like the crunchy fried texture of traditional Hollerkuechle. Our waffles come without cream and fruits. We didn’t have the patience. They have fat and sugar though. And we ate these crispy treats right up. Preheat your waffle iron and grease if necessary. In a bowl whisk oil, yoghurt, milk, and sugar. Add remaining ingredients and mix until a thick batter forms. 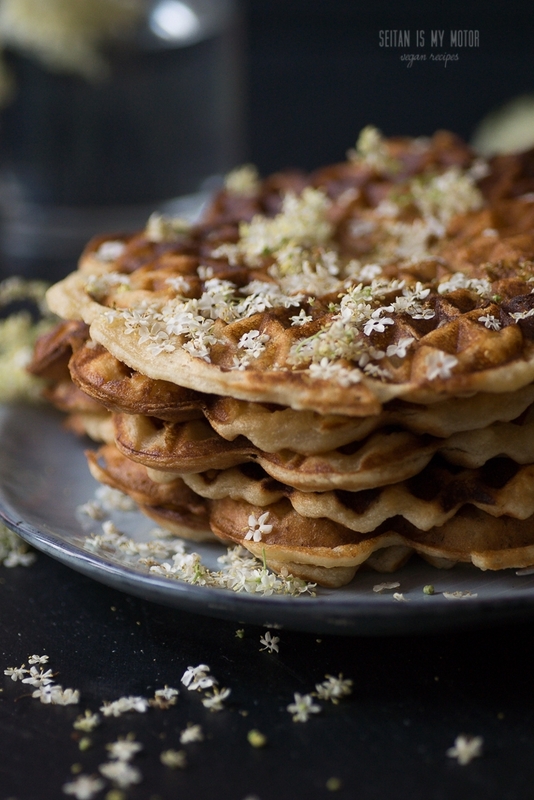 Fill your waffle iron with the batter (about 3-4 tablespoons per waffle). 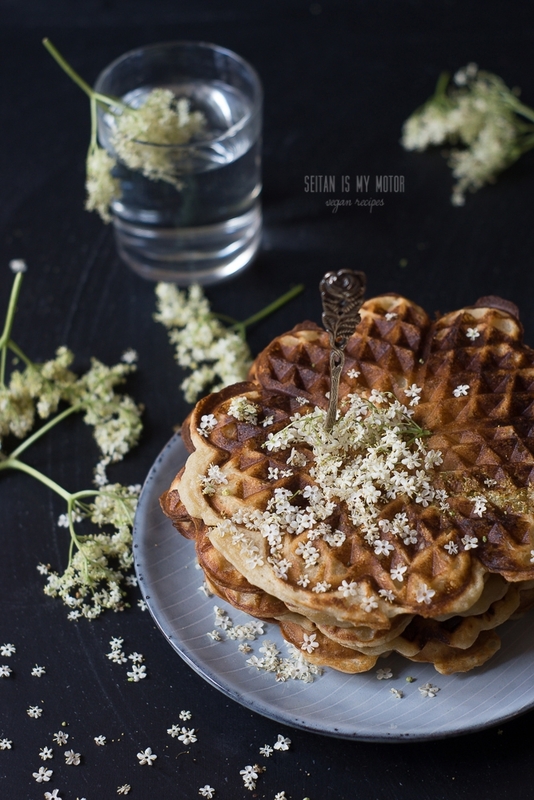 Place two elderflower umbels on top and bake until the waffles are crispy. 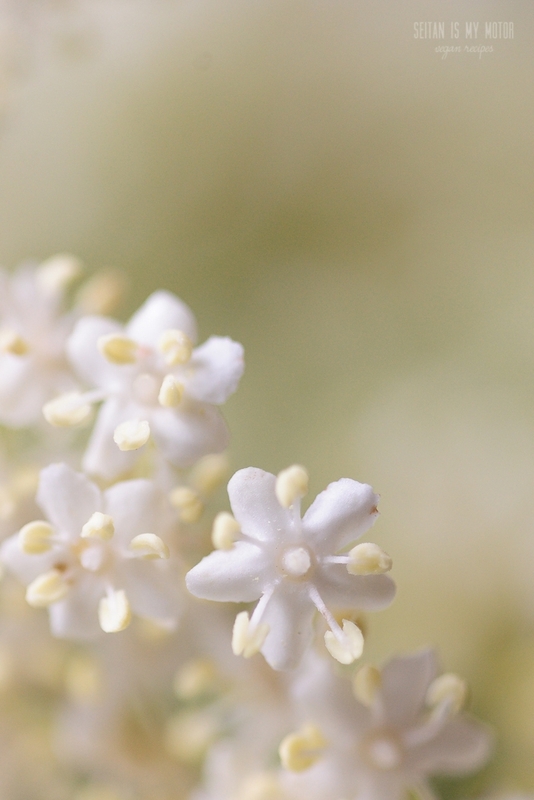 Elderflowers are so pretty! I don’t come across them much…I remember when I lived in Tasmania a neighbour chopped a bush up and left it all on the front verge for collection. We gathered it up and made delicious cordial. I’ll have to keep an eye out for some because it really is such a beautiful flavour.